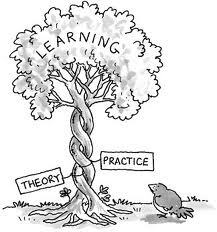 I once found this saying about theory and practice. Theory is when everybody knows how it suppose to work, but nothing works, contrary practice is when everything functions, but nobody knows why. I work now for over a month, a couple of hours each week, as an intern at an elearning institution. The funny thing is, it’s the same institution which I contacted for the H807 innovator interview. So much to making contacts. The interview with the innovator was not only exciting, but very inspiring. When I then read that they were looking for an intern, I applied and got the job. I may not really fit the normal profile of a research assistant (sounds a lot better than intern 😉 , because these jobs are normally given to younger students, but I don’t care if or if not I fit any norm. 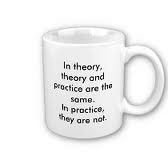 However, coming back to the saying on the mug – there is a great difference in theory and practice. The MAODE study prepared us well in theory, and some H-courses required to practical parts, like H810 or H807 where we were asked to design an (accessible) activity or H808 which asked us to create an eportfolio. We also had to create all kinds of multimedia evidence and I learned to record a podcast and even made a movie, using Xtranormal. However, all that prepared me not enough for my job. I assist in the technical parts and have a lot to do with HTML and CSS and different kinds of LMS (Learning management system). Fortunately I worked with Moodle before, but Olat which the institutions works with, works differntly. And that is just the beginning of the requirements. Right now I have to convert tests from Blackboard (Bb) to Olat, using the Onyx editor to adjust the Bb test to the Olat LMS.